POLL: Matt or glossy kitchen? Which cabinet finish do you have in your kitchen? Or which finish are you going for if you're currently planning a kitchen upgrade? Matt or glossy - what do you prefer? Other - tell us below! Matt makes space more calm and natural and it's easier to keep clean. Coming from my clients perspective, matt seems to win over gloss at the moment. Matt Emulsion Walls Main Rooms. 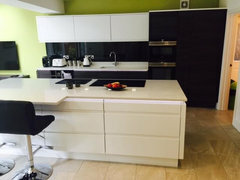 Vinyl Silk Kitchens. 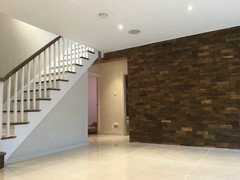 Feature walls Hang some decorative wall paper or stick old oak flooring to a main feature wall as we done on a job in oxshott surrey. Matt is definitely my personal preference, i feel gloss can make your kitchen look dated. I prefer glossy , I think it looks more modern. 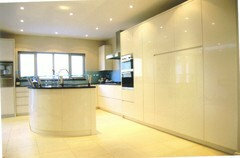 Here is an example of one of our matt kitchens that we have installed, offset by a glossy floor and worktop. We think this looks sleek, modern, and is easy to keep clean! 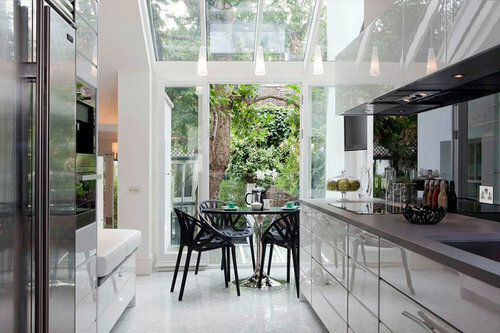 We think that glossy kitchens bring in more light! We find our clients really love matt kitchens. We have found our clients love matt finishes. Matt finishes tend to be more practical, and they look so good. Our clients love the sleek look that gloss provides! Matt is easier on the eye. This bespoke high gloss kitchen was manufactured and installed by pb bespoke kitchens for a large house in Battersea about 8 years ago. Since then our clients have opted for hand painted matt or mid sheen finishes. Really depends on the client/age/style of house, durability and longevity style wise? Matt absolutely! if you want high def faddish now style, for the throwaway consumer? gloss all the way! We find that our clients prefer matte kitchens in modern homes. I think it will reflect more light in to you room. 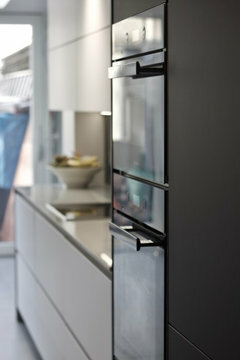 We love matt kitchens! Easy to keep clean, but also luxurious! We find matt kitchens look great! why not have a contrast - be unique! I must say am definitely a gloss fun. Depending on the size of the room, gloss will give a more spacious appearance from reflections in a small room but matt works very well in for large empty rooms. Just bought a Victorian House. Matt is definitely more in character with the building for me! I prefer matt, but then perhaps am biased having just had a matt black and white kitchen installed. To me, there are already enough reflective surfaces in the kitchen in the form of ovens, hobs etc that the matt provides a nice contrast. Perhaps we took it to the extreme with a matt glass splashback and tap! Our clients prefer glossy kitchens because they go well with the lightings and the space. We think matt finishes work nicely . Matt is Definitely on trend at the minute. Matt every time - oozes contemporary and will never date. Matt all day but in durable paint! Matt for us, so much more practical for everyday use. Gloss. Easy to keep clean and looks great. Definately helps in smaller kitchens so the light bounces off to make the room feel bigger and brighter. Matt is a much easier finish to keep clean . I find the comments here very interesting and useful. We had our kitchen custom made twelve years ago. We chose spraying in low sheen 25%. 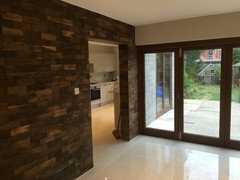 The kitchen was fitted "raw" and then removed to the spray shop. 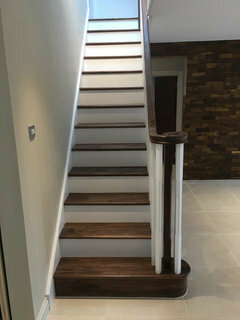 The finish has proved so durable and easy to clean that it is only now going to have a colour change. Twelve years of the same (F&B) colour sounds so boring but the time has flown. The rest of the room including ceiling has been repainted every three years or four years. I may send the doors and draw fronts away for spraying and use aerosol paint (available in F&B colours) for the framing and any visible side panels plus the island. Any thoughts please on these potential choices. Blimey! What a long post and my first here at that. P.S. Has the Grey Ship sailed? Glossy all the way for me. 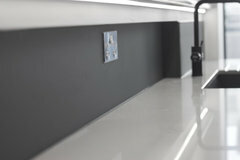 Perfect for bouncing light around the room and I find the sheen adds texture and dimension in the room. Our kitchen is very busy with two small children running around and we have no trouble with the doors, even covered in little finger and handprints. Eggshell is also a great choice if you are in neutral territory with these choice - Brendan, the F&B is a wonderful choice, very durable and long lasting as you know. Don't worry, the grey ship hasn't sailed yet - I don't think it will for quite some time yet! Brassica is a beautiful shade, but will be quite grey and powerful - perhaps team with a lighter, brighter colour or a bold colourful shade. Little Greene also have some wonderful colours. Hope this helps! Thank you for that Danielle - very helpful. The eventual colour choice, if I go for respraying, will be F&B because the sprayers and aerosol suppliers (the latter for DIY) do not make up Little Greene colours, if however I decide on hand painting, the choice of manufacturer would widen to include LG. Well i came on here confused as to what to have for my new kitchen and am leaving more confused than ever..I still love a modern matt shaker but my husband thinks it looks old fashioned now and prefers 'shiny' "We have been trying to make up our mind so long, i think moving might be the answer"I ant it too look fabulous but also not plasticy looking. 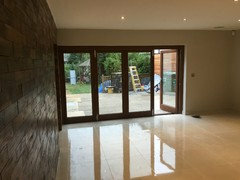 Please some of you itchen companies, tell me what you find looks best and whether a tiled or laminate or wood floor now complete the look more at this time. Also i am thinking of Silestone Quartz tops does anyone feel they would not recommend those having had them? Help will be appreciated. POLL: Would you welcome print into your kitchen? 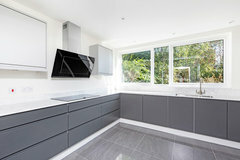 Matt or gloss kitchen units? Kitchen - Gloss or Matt?